We’ve compiled all you need to know about Instagram influencer marketing and the way it works into this simple guide! People who have built a large and engaged following on Instagram are known as ‘influencers’, due to the fact that their followers idolise them and respect their opinions. They may have acquired a loyal following due to their lifestyle, their job or hobby, the clothes they wear or the stories they tell. The pool of influencers is vast and diverse, meaning almost any brand has the potential to utilise Instagram influencer marketing for their industry and target demographic. The emergence of Instagram influencers opened up huge opportunities for businesses looking to authentically market their products to their target audience, and thus the ‘paid post’ phenomenon was born. In the early days, it might have been enough for a brand to send an influencer one of their products as a gift, in return for them posting about it on their profile. But this changed with the rapid growth of the space, as influencers realised they could not only gain free products, but actually charge brands for grid real estate on their profile. Influencer marketing allows brands to reach their target audience in a way that feels far more genuine than traditional advertising. Rather than businesses selling directly to consumers, they are building relationships with influencers who can sell for them. Instagram influencers have a strong and loyal relationship with their followers, as they share many aspects of their life with them. This leads us to feel like we know them personally, so when an influencer we like recommends something, we listen as we would if it were a friend. For example, if you follow a travel blogger for their beautiful photos or funny captions, and they post about an airplane pillow that gave them the best night’s sleep on a long haul flight, you’re more inclined to remember the brand and buy it for your next holiday because you like and trust them. Makes sense, right? With 800 million active users, Instagram has become the platform of choice for influencer marketing. 72% of users said they have made fashion, beauty or style-related purchases after seeing something on the app, proving its power in the digital marketing landscape of 2018! To give an idea of numbers in the Instagram influencer marketing world, Hopper HQ’s annual Instagram Rich List disclosed just how much money the top influencers and celebrities can earn from a single post. 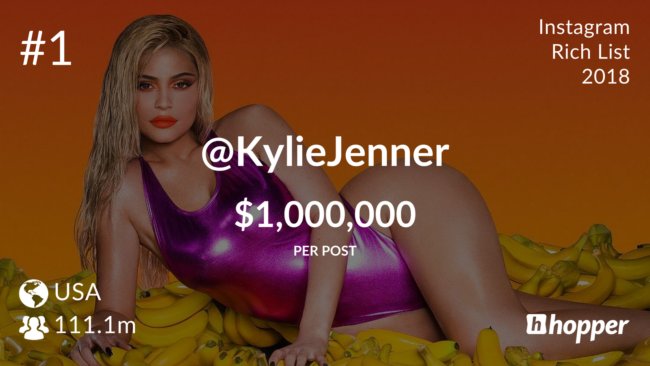 Kylie Jenner bagged the top spot, charging up to $1 million for a product-related post on her Instagram profile. Considering the 21 year old wiped out $1.3 billion of Snapchat’s market value with a single tweet earlier this year, her influence — and that of her whole family — is certainly not to be underestimated. The amount an influencer can charge per post will vary depending on a number of factors, including follow number, engagement rate, and industry. Elle Cuthbert-Edkins, our Customer Success Manager here at Hopper HQ, recently spoke on the BBC about the current state of Instagram influencer marketing. She emphasised the importance of engagement over follower number, explaining that “we’re typically seeing brands work exclusively with influencers who have a 10-20% engagement rate”, ensuring that the followers are truly interested in what the influencer is posting. From our Rich List methodology and data, we found that many collaboration deals are worked out by 100,000 followers. For example, the beauty industry charges on average £162 per 100,000 followers for a single post. For many influencers that have followers in the millions, this level of sponsorship enables them to make a living from Instagram. There’s no strict criteria for being classed as an Instagram influencer. Any user who has a fairly high, engaged following — of people who actually care about what they do — will have an influence over their audience and is a valuable marketing proposition for brands. Due to the existence of bots giving out likes and comments on users’ behalves, as well as the ability to buy followers, some Instagram accounts may look like influencers, but actually don’t have a loyal following or any real influence at all – we call them ‘ghost followers’. 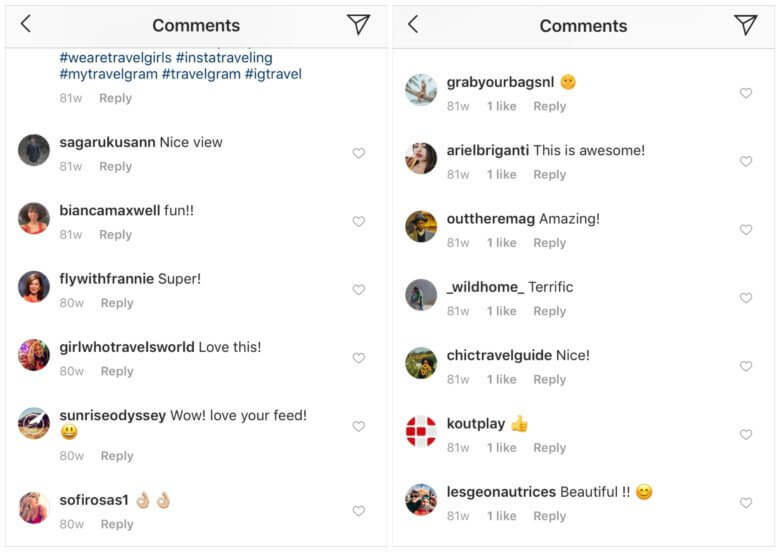 Generic comments such as ‘🙌🙌🙌’ or ‘Awesome shot!’ are likely to be from accounts using an engagement bot, so if these are the only kinds of interactions on an influencer’s posts, it’s likely that they don’t actually have the influence they’re making out. NOTE: these bots will comment on posts of users in a chosen target demographic or using certain hashtags in order to increase brand awareness and get more followers. It makes sense, however they have become very easy to spot and don’t actually start genuine conversations! Another important indicator of a good influencer is that they are responsible with their partnership choices, truly taking into consideration their followers’ interests and ensuring they only do sponsored posts with brands they believe their audience would be likely to engage with. 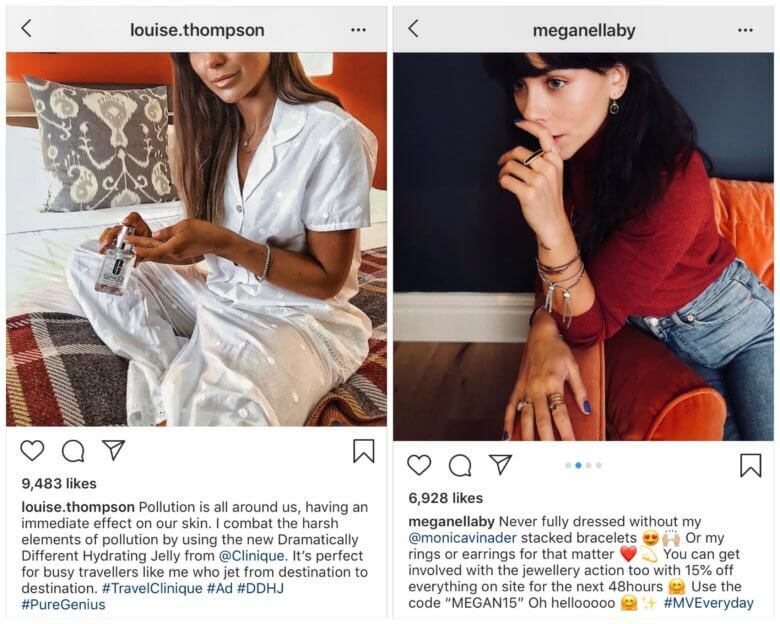 Going hand in hand with this is that the influencers make their own content for a brand, hence why it’s often referred to as a ‘partnership’ or a ‘collaboration’, rather than them simply posting a photo the brand sends them. Building an engaged following is hard work, and a good influencer will not want to post anything that looks alien to their audience or their feed. When strategising an influencer marketing campaign, it’s therefore important to make sure your brand image complements the influencer you’re looking to reach out to! If you decide that Instagram influencer marketing is the right step for your business, the first thing to do is set your budget. It’s an expensive game, and with influencers charging per post and for Stories, a whole campaign can set you back a long way. With a smaller budget, you will be looking for micro influencers to promote your brand. These are influencers with a relatively smaller following (1,000 – 10,000) but who have a high engagement rate on their posts. It is a far more cost effective option for smaller businesses, and micro influencers can have a great deal of influence over a specific audience. On a larger budget, you can think about bigger influencers, but try not to be fooled by vanity metrics such as number of followers and focus predominantly on engagement rate. Once you’ve found people you think could be perfect, do your research as we mentioned above. Ensure they have a genuine following and a trusted, loyal community. See if they’ve worked on influencer campaigns in the past and look at the kinds of products or brands they promote, this will help to inform if they would be a good fit for your company. As well as this, take a read of their comments to see if your target demographic are engaging with their content. And finally, check out which type of posts they’re excelling at (i.e Stories, video, gallery posts) to help inform your campaign. Then reach out to them! Micro influencers are likely to manage themselves, so contact them through the email on their profile or send them a direct message within Instagram. If you’re looking at a larger influencer, they will probably have an agency who manage their campaign requests – this is typically listed in their bio. When approaching agencies, ask for the influencer’s rate card and explain your brand and the campaign brief you have in mind. Go into as much detail as possible (i.e budget, how many posts, the type of content etc) in order to best manage expectations on both side of the collaboration. Influencer marketing has had its fair share of criticism in recent years. Consumers have felt misled as a result of being unaware somebody they follow was getting paid to recommend certain products. This has led to a huge push for transparency among influencers. Hashtags such as #ad and #spon have become standard in a paid post caption, in order to distinguish the sponsorship deals from ‘genuine’ recommendations. 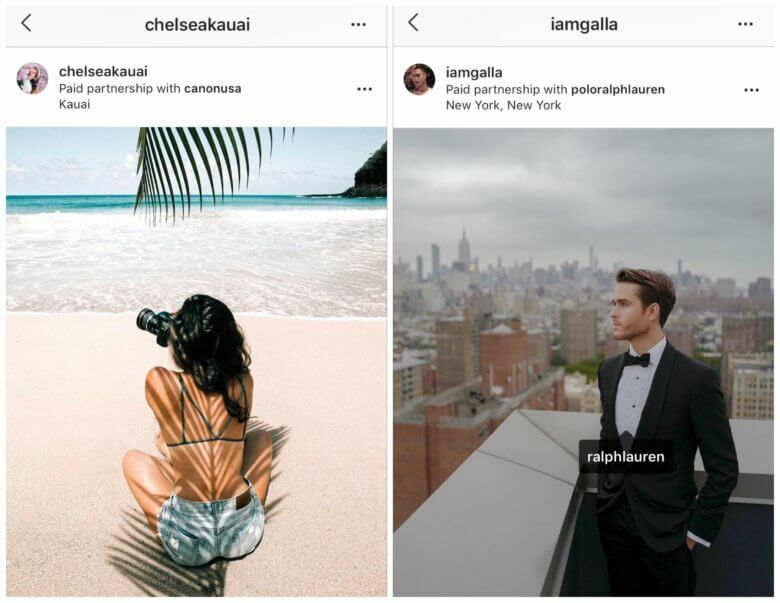 Instagram also created their official ‘Paid partnership’ tag, which sits above a post to inform users that a brand is collaborating with that influencer. While on some levels this takes away from the authenticity that made Instagram influencer marketing so successful, influencers also feel a loyalty to let their followers know they’ve earned money from a post. At one of our recent events, ‘The Power Of Influencer Marketing in 2018’, our panelist Harry Hugo, Co-Founder of The Goat Agency commented on the problematic nature of these CMA regulations, due to the fact that it’s not universal across other advertising channels or promotional sponsorship deals. He gave the example of Neymar walking on to the football pitch wearing Nike boots as a result of his multi-million dollar sponsorship deal. A notice does not appear on our television screens to tell us the boots are being marketed to us, and the suggestion of such would seem ludicrous. Therefore it’s one rule for traditional methods of advertising, and another for Instagram influencer marketing, and it will be interesting to see how the regulations change as the space develops. At Hopper HQ we work with hundreds of influencers all over the world, and always encourage them to only accept partnerships with brands and products they truly like and would use themselves. False promotion eventually becomes obvious, meaning the influence the person actually has shrinks. As a digital population we are developing ‘ad blindness’, meaning we’re essentially becoming immune to marketing. The fact that we click ‘Skip Ad’ on YouTube the second it becomes available, and even pay for the privilege of not being sold to with services like Spotify Premium highlights this. 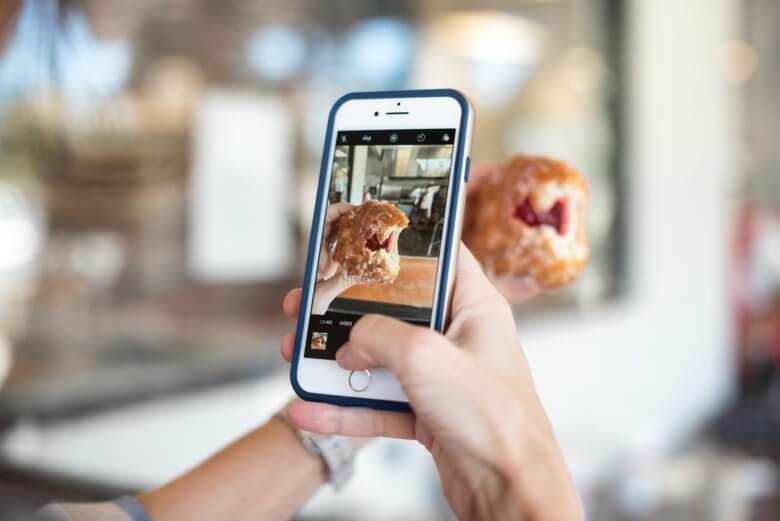 Consumers are becoming more and more savvy when it comes to advertising, and it’s no different with Instagram influencer marketing. As the industry gets more and more concentrated, brands and influencers will need to think outside of the box to keep creating highly engaging marketing campaigns, and we can’t wait to see them! Is there any other areas of influencer marketing you’d like to know more about? Let me know in the comments! Hopper HQ is a social media scheduling and management platform that frees up time for the fun creative stuff! Named in the Top 5 Most Popular Social Media Marketing Software list 2018. Start your 14-day trial today.